Charley turned 2 earlier this month but due to most of the family being ill we didn’t get to celebrate properly. I love a good party and any chance I get to buy a big cake ( eat it ) and have friends & family around is something I relish. We will be hosting the party here at home and we have about 10 little ones, 6 big brothers/sisters and 15 adults. Luckily thanks to the new house we have plenty of space and can spread the event over 2 rooms. 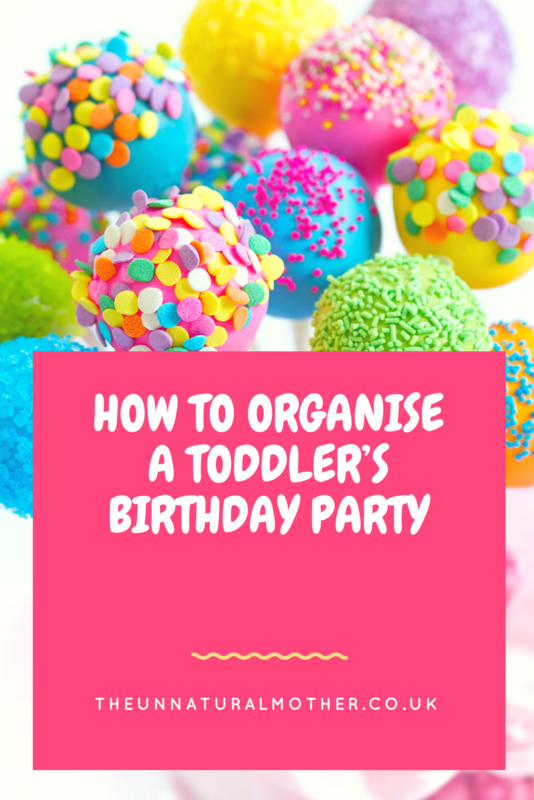 As I am Chief Event Planner in the family I thought I would talk you through how I am organising Charley’s belated Birthday Party. Every party needs invites and I choose to get mine from a company called Basic Invite . 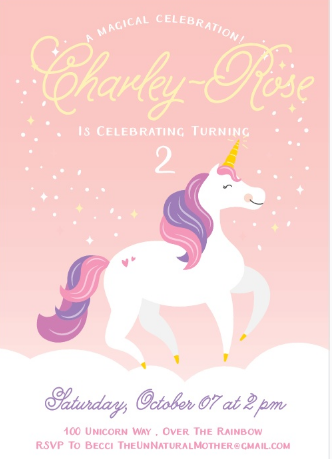 After searching the internet for hours for children’s Birthday invitations I found this unicorn print and fell in love with it. I love anything bespoke and they offer over 180 different colour options to suit individual taste. You also get a choice of envelope colour which is a lovely touch. Nothing worse than a beautiful invite in a boring old white one. Basic Invite offers a printed sample of all their Birthday Party Invitations but I felt confident enough to place the order without one. Delivery was über quick and i am so pleased with our purchase. So much so we have framed one of the cards and put it on Charley’s wall. You can spend a fortune or £10 on decorations and the kids wouldn’t notice but a party is not a party without some bunting and balloons. I took a trip to our local Poundland to pick up some colourful bits and then downloaded a free bunting design I found on Basic Invites website and will be stringing that around the house on the day. If you have a spare £200 then get a DJ or children’s entertainer but if like me you haven’t then grab your iPhone, download the latest kids music album and play some party games. Pass the parcel, music bumps and pin the tail on the Unicorn always go down a storm but all the cool kids are now having Pinatas. Grab one from ASDA, fill it with sweets and let them burn all their energy by giving it a good whack. *Adult supervision required at all time. This is not the time for a Prosecco break. Asda does an amazing Unicorn cake for £12 and I was happily going to purchase that but I have been requested by Harry to make my world-famous T-Rex cake. It’s world-famous as no one thought I would be able to turn on the oven let alone bake a Birthday cake. Well, I proved them wrong ( kind of ) by making a No Bake T-Rex Cake for his 3rd Birthday and it was such a success Harry has talked me into making it for Charley. Luckily she is a huge fan of Harry’s toys and basically saying Rahhhhhh, so I know she will be happy with our choice. As most of the kids who are attending are under 6 and will already be high as kites after the sugary cake, I won’t be doing traditional party bags. I have decided to buy a stack of books and wrap them as leaving presents. Poundland do all sorts of great books and at £1 each it’s actually cheaper than sending them home with sugary crap.I did this for Harry’s 2nd Birthday too and if you are looking to score some brownie points with the other mums this is a good start. 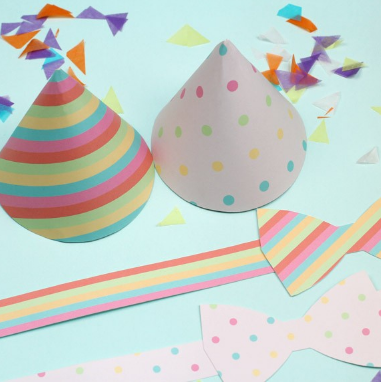 I hope this has helped you in the planning of your little one’s party. If you have any tips or hacks to make the day run smoothly then leave them in the comments below. HAPPY PARTY PLANNING !! "5 Awesome and Super Fun Activities for Toddlers and Preschoolers"